Livermore native, Jack Kassinger, was available on Thursday, November 10th at the McLean County Public Library, for a book signing of his first book "Holding Hands with Heroes". He also recently published his second book "Noble Cause" which is curently only available at Amazon (http://www.amazon.com) . "Holding Hands with Heroes" provides an overview of Kassinger's life, starting with his time in Livermore and covering his career first in the Marines and then as a CIA support officer. 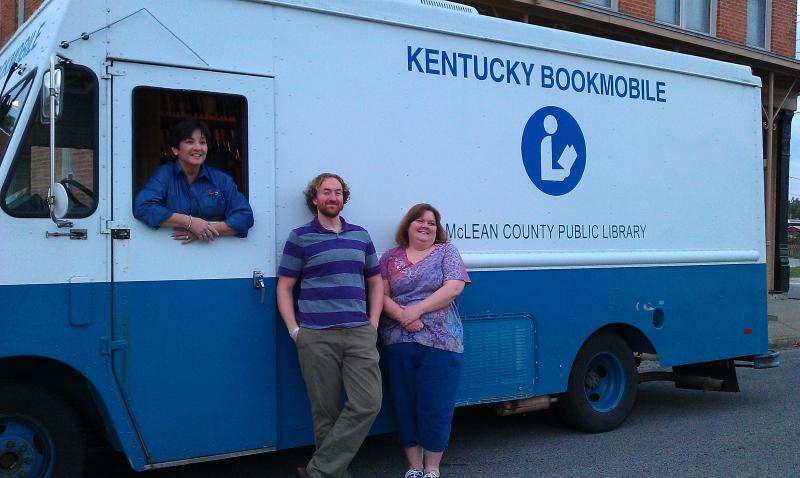 Through a grant provided by the Kentucky Department Library Archives (KDLA), McLean County Public Library now has a BookMobile! Soon, you'll see it rolling through your city. The schedule will be announced soon. September 2, 2011 - Library News! Today, the McLean County Public Library was blessed with a generous donation from the Phillip Sayre Family of Owensboro! They provided the Library with such an abundance of books - it's difficult to know where to start! They arrived at the Library in a horse trailor and are in the process of being unloaded, unpacked and prepared for the Library shelves. Many thanks to the gracious and kind Phillip Sayre Family! "Dianna Hoover and Aimee Newberry working on the distribution of the boxes of books"
Want to Research your Family Tree from Home? Now you can through YOUR Library! .....type your library card number located on the back of your library card into the box labeled "Barcode", (for example P 123) and click "Connect" to start searching! new look for our library! Come and enjoy what the Livermore Community Library has to offer! We have a new logo, a new look and lots of plans on the horizon. The Livermore Community Library was founded in the 1950s by the Livermore Woman’s Club and the City of Livermore. The Library was moved to its present location in 1984 and was funded by the City of Livermore with support from the Livermore Woman's Club. The Library is approved as a 501(c) (3) foundation that can receive tax exempt donations to fund and enhance its purposes for readership throughout the community. The building housing the Library is a historic building. It has housed a Barber Shop, Soda Shop, retail Television Sales store and the Livermore Post Office. 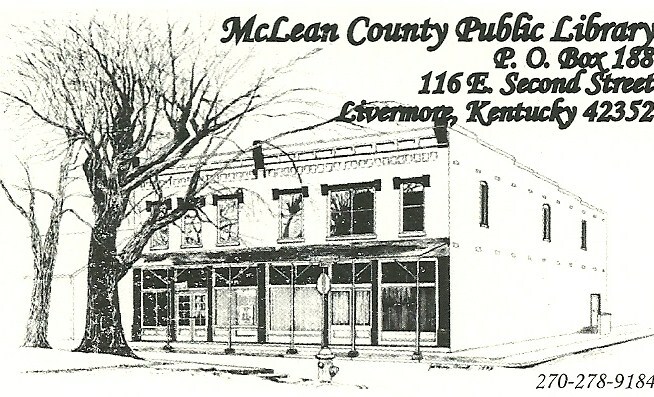 In 2008, the McLean County Fiscal Court received a $100,000 state grant to aid in getting the Library up to standards set by the Kentucky Department of Libraries. An elevator was installed and four (4) new computers were added. The lower level of the Library was repainted; new carpeting installed; and shelving was rearranged. All of the books were culled and many new books were added to the collection, providing a wide variety of subjects from which to select. 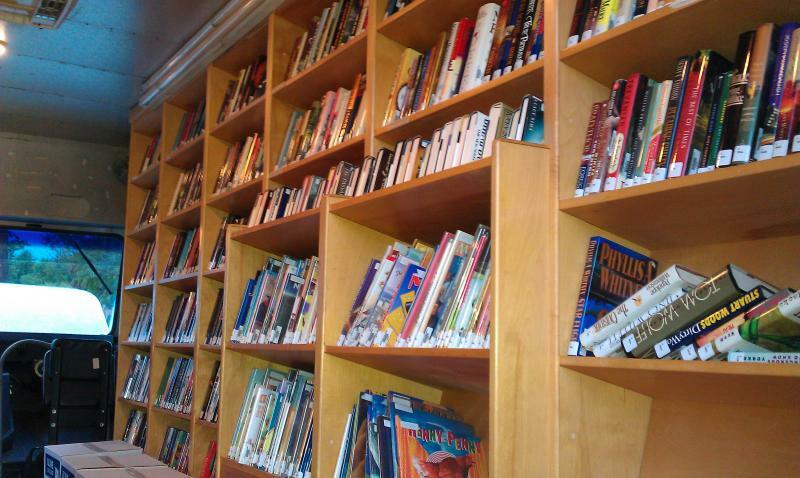 The Livermore Woman's Club completed the process of re-sorting through all of the books and replacing them on the shelves, according to approved library standards. Additionally, the second level of the Library features a Museum displaying artwork including paintings by local artists and exhibits of historic photographs. 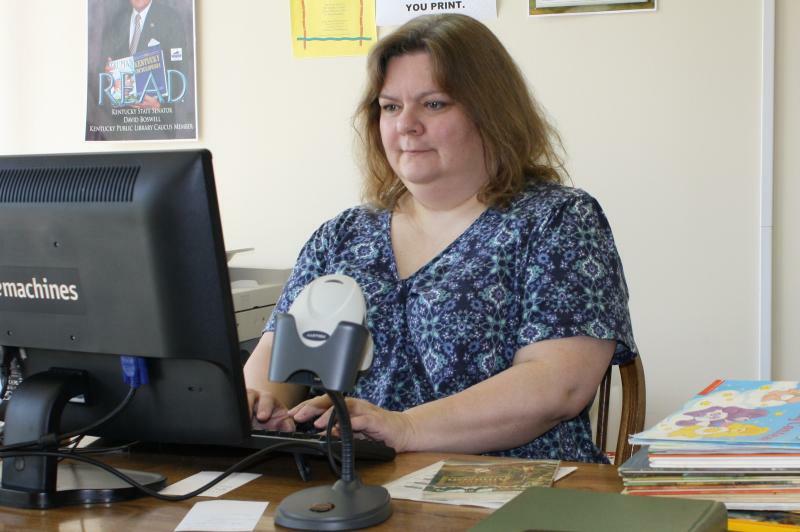 The Library now has eight workstations offering MS Office programs and the Internet. Wi-FI is also available if a library patron wishes to use their own laptop. Before using either the Wi-Fi or the library's workstations, patrons must read and agree with the Library's Computer Use Policy. Parents must give permission for their child to use the computers by signing a form provided by the Library. Also available to Library patrons is the use of World Book Online and NewsBank. These are all databases that can be used for research or pleasure reading. The upstairs Art Gallery/Conference room will be used for civic meetings and for educational activities. The room has been equipped with a Smart Board and speakers and conference tables and chairs. The Library catalog will be online in the near future. Patrons will be able to check the status of books from their home workstation or the library's workstation. Patrons will be receiving a library card for faster checkouts. This will be a time of transition because new books coming in will be given barcode numbers and older materials will need to be added to the database. The Library features several seating and reading areas - including one designed specifically for children, which includes all new furniture. For a fee, the Library provides a fax, copier and printer services. A collection of genealogy research materials are available for Library patrons. The Library is still accepting donations, monetary or reading materials, however, only reading materials that are no older than 4 years, unless a classic. There is a stipulation that if the Library can’t use the donation, that the person donating it agree to allow the Library to sell it or donate it to some other organization or library. 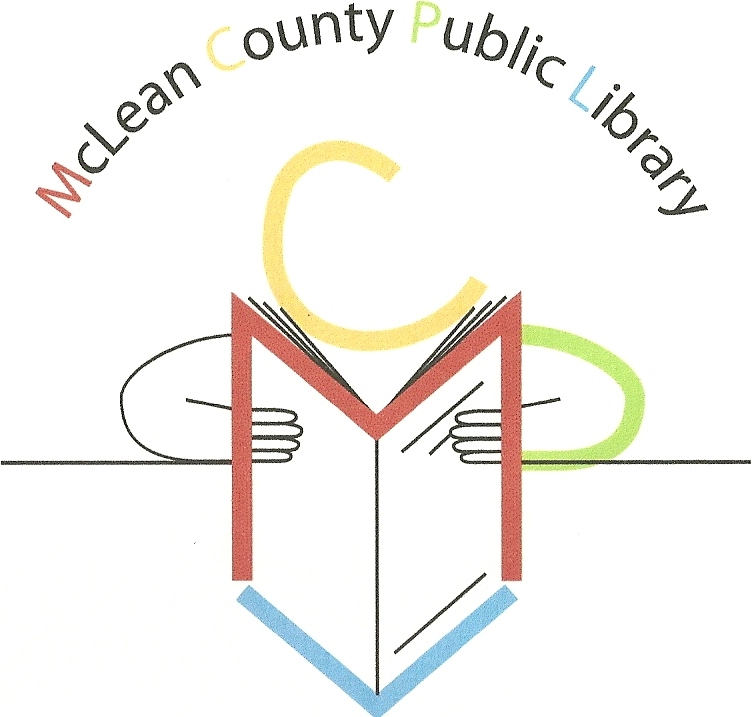 You are invited to participate in the continuing growth of the McLean County Public Library and may show your support by joining the "McLean County Friends of the Library" which meets on the first Monday of every other month at 7:00 pm, starting January 2011. "This Bird Re-Tweet House was designed and constructed by Caleb Baldwin, featuring architechural detail. He worked on this project for over a year." "Open House December 13, 2008"
Former Mayor Eldon Eaton, Former Judge Larry Whitaker & Former Councilman Chester Baldwin visiting in the Genealogy Section of the Library.